Everyone knows that great things can come in small packages, and when it comes to the nuanced perfection of a really good piece of chocolate, the old adage couldn’t be more apt. Robin Autorino started making chocolates as a hobby when she was a single mom trying to entertain her son. Eventually, she decided to leave her corporate job and become a chef. Her journey took her to the pastry kitchens of well-respected restaurants around the Front Range. But her passion for chocolate eventually drew her away from those kitchens and into her own. Since she started Robin Chocolates with a single store selling her confections, the business has grown by leaps and bounds. 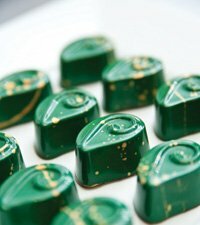 Now found in high-end gift shops and gourmet kitchen stores across the region, her chocolates have become a sensation for those in the know. We definitely wanted to provide Autorino with a challenge, but not something completely off the wall. She teased that if we gave her trout, we’d have to eat it. While certainly a traditional herb, rosemary isn’t usually paired with chocolate. Relieved, we took a bite. Enrobed in a dainty dark chocolate shell, a smooth, perfectly balanced caramel oozed out onto the tongue. The rosemary takes a moment to register, almost more like a smell than a taste; once there, it’s unmistakable but not at all overwhelming. Rosemary is not the only flavor that comes through. Notes of lemon and honey complement and round out the flavor, creating a truly unique and refreshing taste. And like all of her other candies, the geometric shapes and delicate airbrushing make these caramels as gorgeous to look at as they are to taste. Robin’s rosemary lemon caramel is likely not the sort of candy you eat by the handful. It’s a perfect example of a treat to be savored slowly, carefully, and examined every bite of the way. The rosemary lemon caramel is available now. For information, and retail locations visit robinchocolates.com.